As a new parent, My little girl’s very first baby bath time never scared me. Maybe it’s because I have lots of nieces and nephews that I gladly helped out with along the years. Maybe it was all the babysitting I did when I was a teen to save up to buy some cute clothes. Regardless, I had always looked forward to that special bonding time between parent and child. I also came to that bath time pre-armed with some knowledge gained from the aforementioned reasons about which baby products to use. When it comes to keeping your baby clean, there’s a mind-boggling array of options to choose from, whether it is baby soaps, shampoos, conditioners or body washes. So how do you pick the best one? Well it’s difficult to say that there actually is a “best,” that suits everyone. When looking for a shampoo for babies and children, parents should seek a product that will clean their children’s hair and scalp without drying out their skin and without containing a truckload of harmful ingredients. This might seem obvious to you, but as you will soon see, even products that are considered safe and marketed as natural often have SOME ingredients which are not so great. 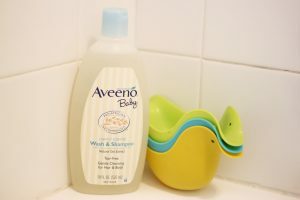 This is our Aveeno Baby Wash & Shampoo Review. Unless you’ve been raising your kids on a remote island with no internet access, you’ve heard of Aveeno products for children. In 1945 Aveeno, now owned by Johnson & Johnson, was founded and they first introduced a Soothing Bath Treatment that contained 100% colloidal oatmeal. All of their products since have contained oat extract and/or colloidal oats. 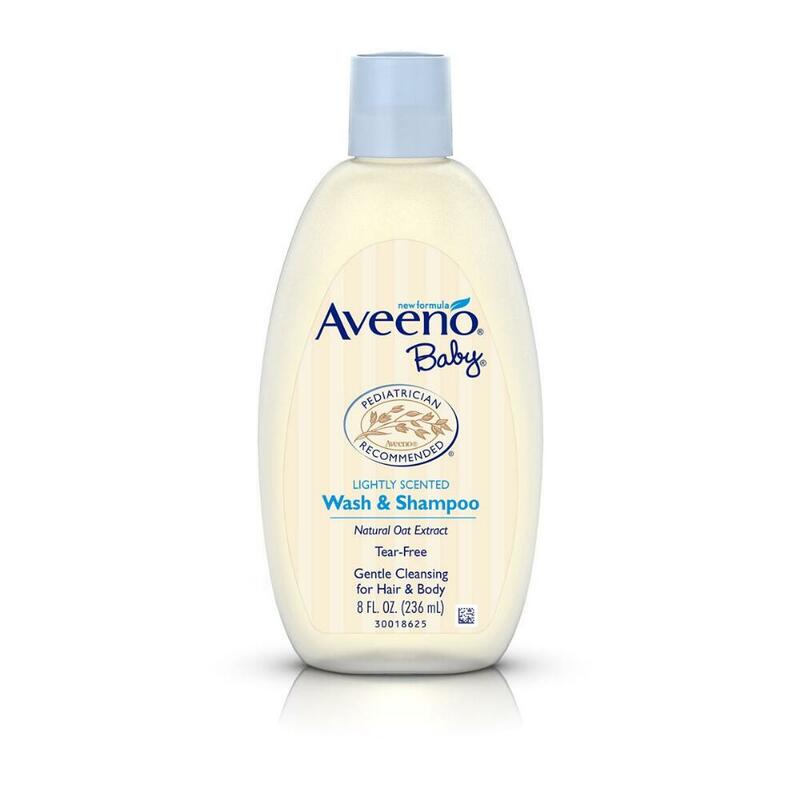 In 2000, Aveeno launched their own line of baby products meant to gently clean, moisturize, and protect a baby’s sensitive skin. The oat ingredients are supposed to provide a soothing effect while gently nourishing delicate skin. My siblings have been using Aveeno’s products for years and my nieces and nephews all seem to enjoy them, so with that resounding recommendation I tried it as well with mostly positive results. The product has a pleasant fresh scent that is not overpowering, and it lathers nicely to create fun bubbles for a child to play with. My daughter likes the scent and especially the bubbly bath water. This two-in-one product takes care of the head to toe cleansing without stripping the skin of its natural oils, and babies do not sweat as much or get very dirty, so there really is no need to spend your money on more than one product (and expose your child to even more chemicals). Pediatricians recommend this product due to the blending of the natural oat extract in a soap-free, paraben-free, and tear-free formula that rinses off easily and doesn’t leave the baby’s skin tight and dry. It is also hypoallergenic, suitable for sensitive skin, and can be used every day, even on newborns, providing the gentlest cleansing for both body and hair. The oat kernel extract has very hydrating properties which is why using this on your baby’s skin helps it from drying out, though if your child has extremely dry skin, you might still need extra moisturizer. It is a soothing cleanser for babies and kids (and in a pinch, even works well for adults). Until a baby starts moving around on the ground and really getting dirty, a daily bath isn’t usually needed (assuming you’re quick with clean diapers, messy feedings and spits-ups, you’re already cleaning the parts that really need attention: the face, neck and diaper area). Infants will only really need a bath two or three times a week: at first a sponge bath, until their umbilical cord stump heals roughly one to four weeks after birth, then a baby tub bath, and eventually a regular tub bath, after the baby can sit up on their own and outgrows the small baby tub. This will leave your baby’s skin clean, soft, moisturized and healthy. Bathing a baby more than two or three times a week can be problematic because our skin excretes a layer of oily substance, called sebum that serves to lubricate and waterproof. And since baby wash and shampoo are surfactants, it breaks down these oils that are needed to protect the skin from drying out. This is especially crucial when it comes to washing little private parts. If you browse reviews online, nearly every shampoo has negative comments from parents complaining that their baby’s skin was dried out from the shampoo, and while I have no doubt that there are times when the shampoo is to blame; over-washing is more likely the reason. 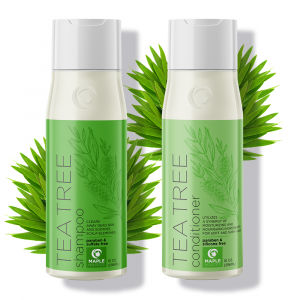 Ingredients– Water, Cocamidopropyl Betaine, Peg80 Sorbitan Laurate, Sodium Laureth Sulfate, Sodium Chloride, Peg150 Distearate, Sodium Benzoate, Tetrasodium Edta, Fragrance, Polyquaternium10, Butylene Glycol, Avena Sativa (Oat) Kernel Extract. May Also Contain Citric Acid. PEGs (polyethylene glycols) are petroleum-based compounds. Depending on manufacturing processes, PEGs can be contaminated with measurable amounts of ethylene oxide and 1,4-dioxane, which are possible human carcinogens. Ethylene oxide can also harm the nervous system. 1,4-dioxane is also persistent. In other words, it doesn’t easily degrade and can remain in the environment long after it is rinsed down the shower drain, and there are two PEG ingredients here. Tetrasodium EDTA is a water-soluble ingredient used as a “chelator,” which means it binds to certain mineral ions to inactivate them. Through this action, it can prevent the deterioration of products, as it stops the growth of mold and other microorganisms. Tetrasodium EDTA also helps maintain clarity, protect fragrance compounds, and prevent rancidity. One of its main uses is to help personal care products work better in hard water. This used to be on my top “avoid” list, however, as more information has become available, it appears to be a lower risk ingredient. While it does have a dubious history in the way it’s made, the final chemical is not a carcinogen. 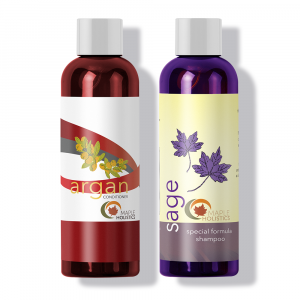 Sodium Laureth Sulfate –Most people know to look for sulfate-free products if possible. They are somewhat harsh chemical cleansing agents that are often used in industrial cleaning products. Sodium Laureth Sulfate is also very bad for the environment and has been shown to be lethal to aquatic animals. 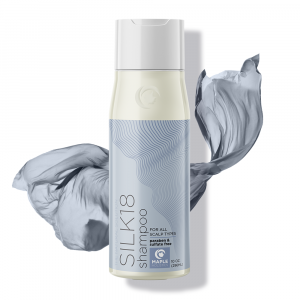 Even though sulfates themselves are no longer believed to cause cancer, when they are combined with other compounds, they can be quite hazardous. Finally, Butylene Glycol is a known form of alcohol, and those that suffer from Eczema should do a test run to see if there is any allergic reaction to this product. Though these are all very commonly used in personal care and cosmetics products, and none of these are conclusively harmful, parents should be aware of them and the potential effects they may cause. I want to stress that I’m not saying this product is dangerous. If it were, I certainly would not be using it, but it really bothers me when companies portray their products to be something they are not, and this certainly isn’t as “natural” as Aveeno would have you believe. Another aspect about this product that I’m unhappy with is the bottle itself, it does not offer a good grip, especially for slippery hands. I also prefer a pump top to get an exact amount (and it is easier to use when holding the baby with one hand). The market is chock-full of baby care options all vying for your attention with attractive labels that make them appear 100% baby friendly. You need to wise up and make sure you know what you’re buying and what you need to look out for. While buying baby care products, it is very important to keep in mind the sensitive skin of your child. Choose only products which are specially formulated for babies. The chances of your baby getting skin irritation and/or infections are reduced as the ingredients used in these products are gentler as compared to regular products for adults. That being said, gentler doesn’t mean risk (or chemical) free, and you need to always check the ingredients label. This isn’t to get you paranoid, rather it is meant to educate yourself as to what ingredients are not optimal, but are still considered safe VS ingredients that should be avoided, period! 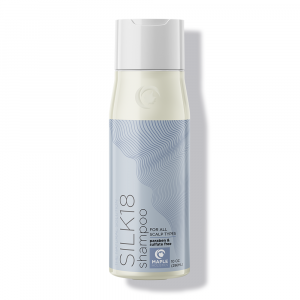 There is no one product that is perfect for every skin type, but this shampoo is as close as you can get with a largely available and affordable well-known brand to find a universal body wash and shampoo that is, over-all, safe for your little one. Though I’m not overly happy about some of their ingredients, the results seem to speak for themselves. 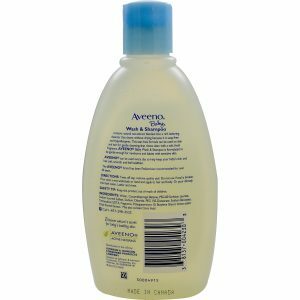 I do have several other Aveeno products in my household, and they work well too. They seem to be less harmful than many other similar products. There is no such thing as a personal care product that is chemical free, because they all contain chemicals. The closest you can get to natural is using plant based chemicals, which are better than artificial ones, but also need to be checked carefully for side-effects. Slowly but surely my family and I are switching over to organic brands of toiletries, including children’s personal care products. You can usually find a good variety at either your local health food store, or by searching online. They tend to be more expensive, but I prefer not having to worry about any negative health effects, however slight they may be (though I am in no way judging people who are hard pressed financially and go for the cheaper products). 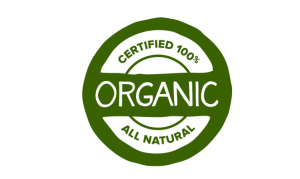 Keep in mind that not all products marked “natural” or “organic” are in fact wholly natural or organic. 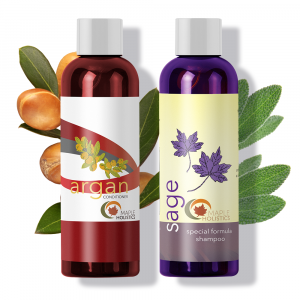 I have no doubt in my mind that a true organic and natural shampoo would be a better alternative. So far I have yet to find one that works as well, but when I do I’ll likely switch over to it. Till then I will continue to use this product. It might not be the best at the end, but it’s been the best so far. A Wash and Shampoo combo that blends into a nice lather that gently cleans your baby’s delicate skin and hair without drying it out. 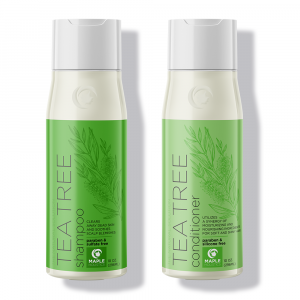 Formulated with hydrating oat kernel extract, this product keeps your baby’s skin and hair soft and soothed. The light fresh scent is not too strong. Tear-free, paraben-free, soap-free, and hypoallergenic. Is not as natural as it portrays itself to be, and some of the ingredients are less than optimal, especially in a baby product. The bottle itself is not made in a way that affords a good grip for slippery hands. A pump-top would have been much easier to use and to get the exact amount out of. Some people prefer unscented products. Please note, baby products should not cause any allergy or irritation to your baby. If you observe any rashes developing on your baby’s body or any discomfort experienced on the skin after using the product, immediately discontinue using it, and you may wish to consult a doctor in case of such incidents. Thanks for stopping by MapleHolistics.com!